This story or more triangle has to contain the most heartbreaking scene of the movie. 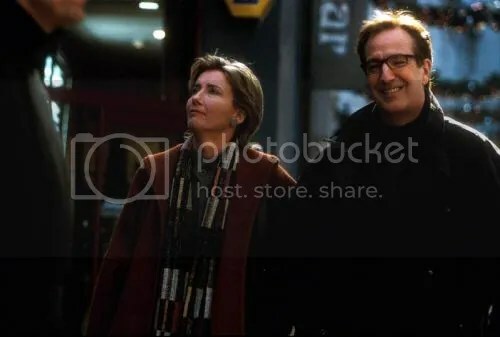 Harry (Alan Rickman) is married to Karen (Emma Thompson) and they have two children. Mia (Heike Makatsch) is Harry’s new secretary and makes no attempt to hide the fact that she fancies him. Before Harry goes Christmas shopping, Mia wants to know if he is going to get her a gift for Christmas. This makes Harry think about what he is going to get her, he decides on an expensive necklace. The thing about buying the necklace was that Karen was with him, and saw him at the jewellery counter but states she is not expecting anything. On returning home from the shopping trip she looks in his pocket and sees the necklace looking rather surprised but happy. We then see Mia with the necklace on Christmas Eve, whilst shifting back to Harry and Karen with the children exchanging gifts and Karen picks what she thinks is the necklace, but it is in fact a Joni Mitchell CD. She goes into the bedroom with “Both Sides Now” playing, which in itself is bad enough but the acting from Emma Thompson is fantastic. It is practically impossible not to cry with her. It really is the most heartbreaking part of the movie, as at that point you know Karen thinks her husband is having an affair with Mia and has the break down but composes herself to then leave with her family to watch the children’s play. I think this story line is so heart wrenching and difficult to watch, because even as the viewer you do not actually know what went on between Harry and Mia. Other than him giving her the necklace. So you can pretty much decide yourself what you think went on. Especially with Harry arriving in Heathrow at the end, and seeming like he and Karen are going to give it another go or at least try to sort things out. She does not seem totally sure however. So what do you think went on between Harry and Mia? Mia was obviously a character who you do not like at all, as your not supposed to, attempting to split up a family because she wants Harry is not the best way to win over an audience. But the way in which she presents herself really does not help her in the likeability factor at all. Well she got her necklace, but did she actually get anything else? Is there something about an already taken man or something? This triangle is very interesting and puts up the age-old question of men cheating and what do you think about it all? That moment in Love Actually is brilliant. Emma Thompson is so perfect in the role and it’s so true to life. Instead of having a screaming match she just takes a moment by herself, and then comes back out in super-mum mode. Amazing performance. It is the most heart-wrenching story of the whole movie and I kept praying for Alan Rickman’s character to be strong and resist the blatant temptation. I agree with Katie that Emma’s performance is amazing and it’s cool that they didn’t make the ‘betrayed wife’ into a screaming lunatic, but instead with such admirable grace. Overall I like this movie but could totally do without all the foul language and blasphemy. “Overall I like this movie but could totally do without all the foul language and blasphemy.” – that’s alright, it’s just how real people in the real world go about their business. LOVE the scene with Emma Thompson crying to Joni Mitchell on the stereo. Thompson is an actress who communicates thinly-veiled vulnerability so amazingly well; she’s the only one to play Karen, a character that another actress might have mistaken for a carping, shrewish “wronged woman.” Emma Thompson makes her so much more than that. On the flip side, I always thought Heike Makatsch got a little shafted being cast as the diabolical “other woman.” Her part is written with so little depth that it doesn’t jive with the others’ character arcs. I love that movie! Emma Thomson is amazing in that scene! what can be said about emma thomsons portrayal that hasent been already said. i will cry again and again with her ever time i watch love actually.